Imbolc Festival 2016 was celebrated on the 7th February in Cadamstown, County Offaly. Hosted by the Slieve Bloom Association, the revived festival is now in its 4th year. A brave crowd faced the elements on Sunday afternoon as Storm Imogen warmed up. Attendees gathered in Cadamstown before ascending to the Bracket Stones on Spink Hill in the Slieve Bloom Mountains. There, amidst gale and hail, the group was welcomed by Slieve Bloom Association Chairperson, Cllr. Carol Nolan. President of the Association, Mick Dowling, with a wealth of local history, spoke about the tradition before the milking was demonstrated. There were five goats at this years festival, including two kid goats. 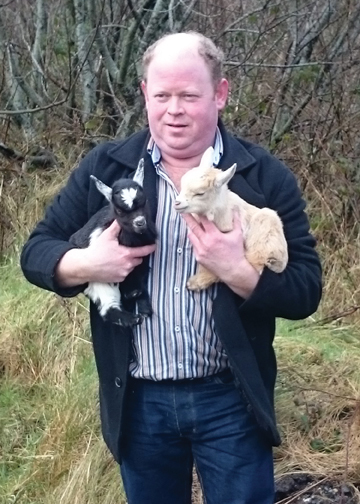 ‘Susie’ who is the new mother to the two kids was crowned Imbolc Goat 2016. Following the coronation the party continued to Swan Cafe in Clonaslee where all enjoyed some much need warm refreshments which were kindly sponsored by former Association Chairperson John Rigney and family. The Association would like to thank all those who helped spread the word and those who turned up on such a blustery Spring afternoon. 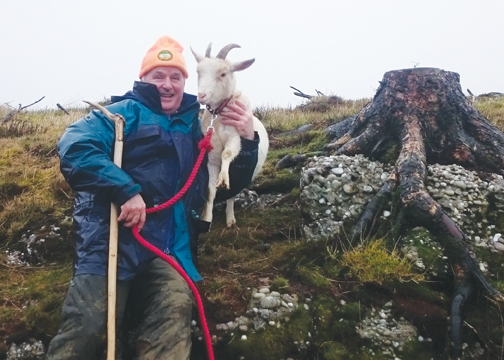 Special thanks to those who brought their goats to take part in Imbolc.